Emerald Freight is the choice of many businesses across Ireland and abroad for their china shipping agent. Below are only a few areas of our expertise and some of the reasons we are the choice of many businesses. We offer affordable solutions for importing from China for all business types, from businesses using Alibaba to source their products in China, other large wholesalers suppliers products such as Electronics, Building & Constructions materials, Stationary and more. We offer the best rates for importing from China by air freight & Sea. Having an extensive Network, and local expertise, we have an on the ground agent who can take the hassle out of inspecting the shipments before they are sent. from all Shipping Ports in China. Emerald Freight offers its services across the Globe, we can arrange Imports from China to the USA, Nigeria, Malaysia, Australia, UK and many more. Our vast networks expand’s globally. 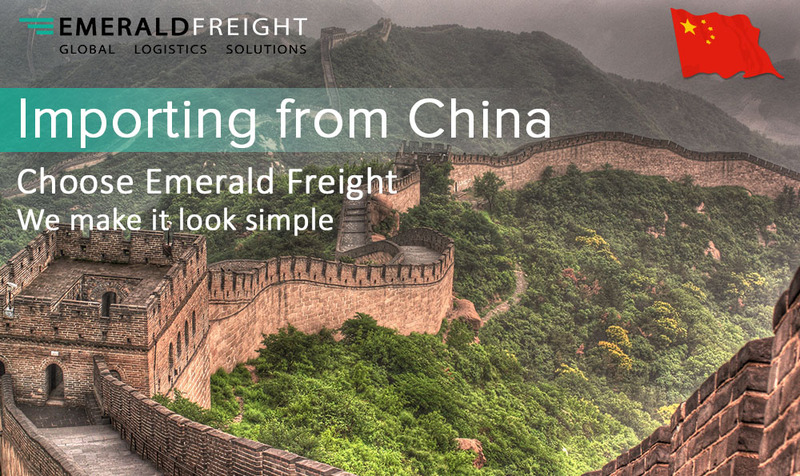 Emerald Freight offers the complete package when it comes to your supply chain requirements from China, whether it’s Ocean Freight FCL, LCL or Airfreight we have the solution for you. We have an expert team of Import Specialists ready to handle your shipments from booking-collection- transit reports-customs clearance & delivery, we offer you a point of contact for the entire process as we realise how annoying it is to be passed to numerous people. The team are aware of ‘what our customer requires’ they know how important it is for your business that all updates whether good or bad are provided to you as they happen throughout the transit. The team are also available to provide expert advice if it’s your first time purchasing from China/Hong Kong. Emerald Freight provide an additional platform, which would add value to the regular Importer who has many shipments in transit, FCL/LCL or Airfreight can log on and view the ETD-ETA download copies of the MBL-Packing lists- Commercial Invoices- Pod’s Etc. This is always valuable information for any Supply Chain Manager. As the regular importer from China is aware, the rates for 20ft/40ft go up and down regularly, please contact our Business Development Director and inhouse expert for all our ‘Far East Traffic’ Mr Mick Woods for rates. Not every business has enough cargo to fill a 20ft container and this is where our excellent rates via our chosen co-loader come in to play, LCL (less than container load) is a popular mode of transport and if you can wait the approx. 35-38 days you will make a good saving when comparing to Airfreight. Through our chosen network of professional partners, we negotiate the best airfreight rates for each airfreight request, the beauty about Emerald Freight is that unlike the multi-national forwarders we are not contracted to use certain offices, in fact we ‘bench mark’ approx. 3-4 partners to ensure we are getting you the best possible price, we are about building a working relationship with our customers and not making quick once off revenue. How quickly we respond to you with our quotation will depend on the time of day we receive the enquiry, most of our China partners respond with rates even outside of business hours so we can normally get back to you within two hours, otherwise it’s the following morning. Airfreight is based on the chargeable weight, find out more by clicking on the below link. You have two options, either the supplier handles the shipping process, or you do it via a freight forwarder. Once you let the supplier handle the shipping process you are giving away the control and transparency. Firstly, you don’t have a choice on which shipping line your container moves on. Secondly, you have no-one fighting for space when space is limited, for e.g. Chinese New Year. You also don’t know if the supplier quotes the actual market price for the ocean freight and other charges at origin. The truth is, Chinese suppliers/sellers often do add a few hundred dollars on top of the shipping fee or quote less and charges follow the shipment and your liable once the container arrives at Port. It’s fair to say, the buyer is far better off working directly with a reputable freight forwarder in their own country than going for what seems like the best price, as this is not always the case. Emerald Freight takes the stress and hassle out of the process and act as your trusted partner within your supply chain. The port of Chiwan is part of the Shenzhen port in China’s Guangdong Province, which is one of the fastest-growing container ports in the world. Chiwan port is mainly utilized for the changing of sea crew, mostly by container ships, bulk carriers and offshore supply and support vessels. The Port of Dalian, founded in 1899, is situated at the southern end of the Liaodong Peninsula on the Yellow Sea in Liaoning Province. It is the northern most ice-free port in China. It is the largest multi-purpose port in Northeast China, serving the seaports of North Asia, East Asia, and the Pacific Rim. The port of Dalian is the second largest container trans-shipment hub in mainland China. Guangzhou Port is a vital hub for the industries of the Guangdong Province and the surrounding areas and is a key port for our Chinese import service. The area is known for vehicle assembly, bio-technology and its heavy industry, and so containers both 20ft and 40ft are highly in demand to deliver these goods from China to the UK & Ireland. Serving as a marine gateway to the Southern part of China, the port of Hong Kong is the world’s leading port in terms of handling and operating container vessels. The largest port in the world, the Hong Kong port has been widely regarded to be the pivot in the development of the province of Hong Kong.The port enjoys a very important place in the list of China ports. This is mainly because of the port’s geographical placement helping it to achieve a required pathway between the Western marine operators intending to reach the farther parts of the Eastern world. With the local government planning a harbour-side industrial zone for heavy industry, Jiangmen is an up-and-coming port for all things Freight. The city of Jiangmen lies next to a network of intra-city roadways and highways, which encourages the cheaper shipping from this port from China to Ireland. Since the 90’s, Shanghai Port has been growing rapidly, However, there were lots of issues including inadequate water depth, water resources lacking, as well as a greater gap in container terminal handling capacity. With this in mind the building of Yangshan Deepwater Port began. Yangshan Deepwater Port Project is divided into the East China Sea Bridge and the Harbor City three main projects. Project was started in April 2002, and completed a project in 2005, including a length of 1600 meters. There are deep-water berths which can accommodate the fifth and sixth generation container ships or containers standard shipping, with port water area of 3,167,000 square meters and the port land area of 1,596,500 square meters. According to the plan design, Yangshan Deepwater Port will be completely finished in 2020. The total investment budget of this project is more than 500 billion yuan.